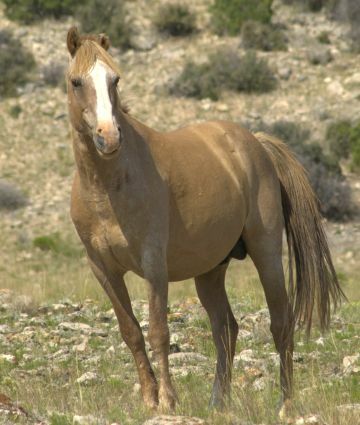 The stallion Durango is likely best known for his unique appearance. 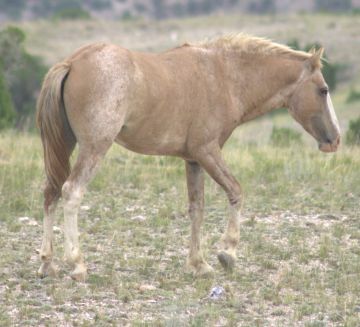 He is a beautiful apricot dun roan in color, and much of his left ear is missing from a fight. This year, Durango and his mare have a new colt in addition to their two year old filly. While Medicine Bow had the family, Durango was always close by watching and healing. This week, Durango has taken the family back from Medicine Bow; and Medicine Bow has a few new kick and bite marks on him. Durango’s wound is still healing, but it seems to be healing well. 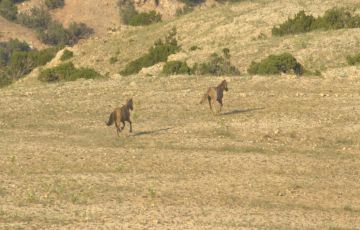 Medicine Bow still remains close as he attempts to retake the family. Last night, Medicine Bow called out a challenge to Durango, who proceeded to chase Medicine Bow at full speed for a considerable distance. The two eventually ran out of sight; but judging from the amount of time it took for Durango to come running back, there was likely a small fight that Durango won. Medicine Bow ran back about five minutes after Durango returned. By that time, Durango had started to move his family away from Medicine Bow, though Medicine Bow did continue to follow. It will be interesting to see how this all plays out. We are very happy to see Medicine Bow coming into his own and learning how to obtain and keep a family; but we are also happy to see Durango win back his family. 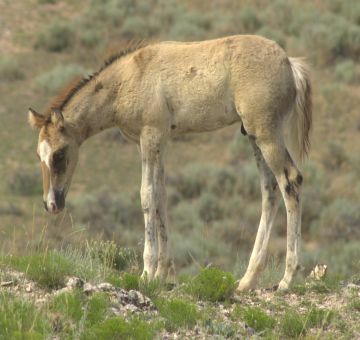 As a side note, though the Pryor horses do get most of our attention, they aren’t the only inhabitants of the range. 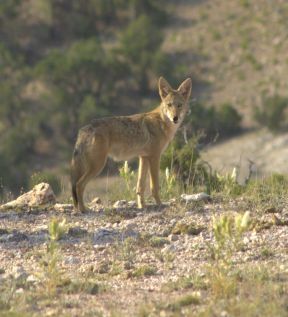 They share it with a number of other animals, such as this young coyote we startled last night while searching for horses. I will continue to post any pictures I take of other Pryor wildlife.